The lightweight Solo Stove 2 Pot Set is the companion pot set crafted specifically for use with the Solo Stove Campfire. 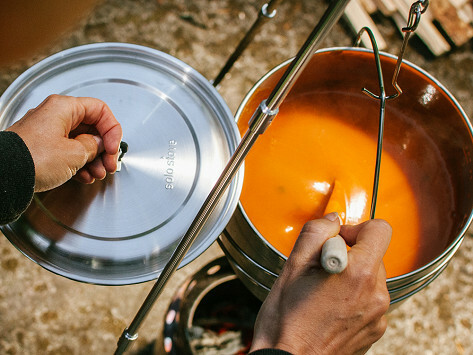 When nested, the Solo Stove Campfire fits inside the 2 Pot Set for easy storage. Made with durable stainless steel, the Pot Set comes with two pots that can cook for four or more people. Dimensions: Small: 7.7" diameter x 2.8"; Large: 7.7" diameter x 5.3"
Weight: Small: 1.13 lbs. ; Large: 1.5 lbs. Huddle around the perfect fire. 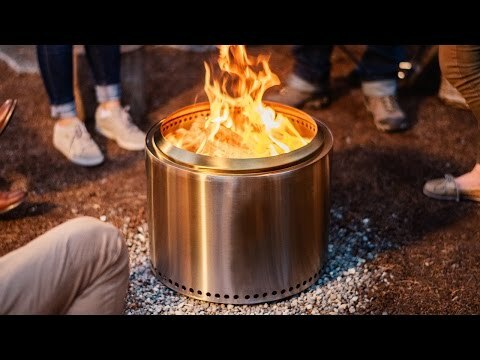 This stainless steel bonfire pit is tough enough to last a lifetime. Besides its timeless single-sheet, minimalist design, Solo Stove stands out for its double chamber build. Air comes in through vent holes at the bottom and rises between the walls to the holes at the top. This circulating, preheated oxygen fuels the flame, burning it easily. With less smoke and fewer logs, you can indulge in all your favorite campfire classics (marshmallows, hot dogs, s’mores). Meanwhile, its ash pan catches debris and acts as a shield that prevents scorching the ground below. Solo Stove was meticulously engineered to be the cozy center piece for your next camping trip or backyard outing. And the best part is it’ll be entertaining and warming friends and family for generations.